If you’ve seen the new James Bond film “Skyfall,” then you were probably struck by Javier Bardem’s portrayal of the villain, Raoul Silva. He’s a bad dude, and his evil island lair seems a fitting place for him — a rotting heap of buildings sitting out in the middle of the ocean, populated with derelict buildings. It’s so creepy, that you think it can’t be real. But here’s the thing. The island is real. And its true history is even creepier than you can imagine. 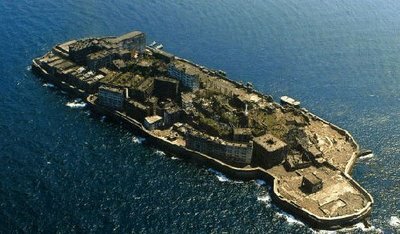 The island is known as Hashima, or alternatively as Gunkanjima (“Battleship”) Island, and it sits about nine miles off the Japanese coast in the East China Sea. In the late 1880s, coal was found on the sea floor beneath the island. In the early days, Japan’s Mitsubishi company, which was mining the coal, would ferry miners to and from the work site from Nagasaki. Then, the company decided it would be easier to just build houses for the workers, and their families, on Hashima itself. Giant, multi-storey concrete apartment blocks went up. Schools, bath houses, temples, restaurants, markets, even a graveyard, were built, all on a space the size of a football field. “Once they reached 5,000 people or more out there, it was recognized as the most densely populated place on earth…ever,” says Thomas Nordanstad, a Swedish filmmaker. A decade ago, Nordanstad and CM von Hausswolff became interested in Hashima’s history, and wanted to make a documentary about the island. So the filmmakers went to Japan, but found that the Japanese weren’t interested in talking about it. In one scene, Sakamoto returns to the apartment where he lived with his family 30 years ago. “My mother’s decorations are still up here,” Sakamoto says. A few seconds later, he finds the marks on the walls that recorded his sister’s height through the years. Hashima, you see, is completely abandoned. The buildings are slowly falling down, worn away by the wind and the waves. The film follows Sakamoto as he finds a schoolhouse with the teachers’ names still written on the blackboard. Sakamoto reflects on the people who once lived there and risked their lives in the mines below. The documentary is now a decade old. But two years ago something strange happened. Actor Daniel Craig, who plays Bond, was in Stockholm shooting a different movie. He was staying at a hotel where one of Nordanstad and von Hausswolff’s pictures of Hashima was hanging on the wall. Nordanstad remembers being introduced to Craig at some event. Skyfall only features external shots of Hashima. The scenes on the island were actually shot in a studio. That’s because Japanese officials don’t allow anyone to set foot on the island itself. 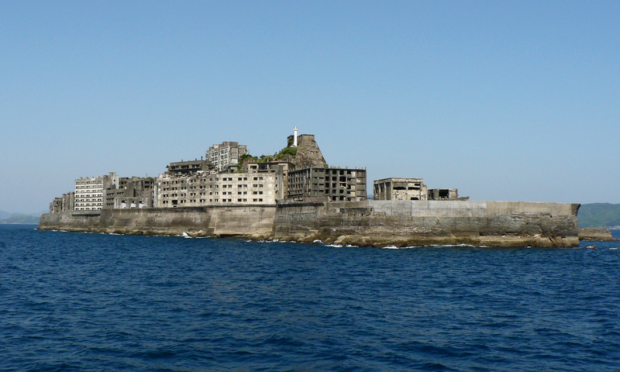 But lately, interest in Hashima as a grisly tourist site has grown. A boardwalk has been built around half the island, but that’s about as close as you can get. Meanwhile, Doutoku Sakamoto wants the island to be recognized as a UNESCO World Heritage Site. But South Korea objects, because the Japanese allegedly used Koreans as slave laborers on Hashima. It’s yet another shameful chapter in the island’s history. The place, says Thomas Nordanstad, is haunted. Definitely leaves a chill down your spine!